Fort St. Elmo Valletta has a prestigious rich and colourful history for its role in protecting the approach to the main harbours of Malta. It is well known for its function during the Great Siege of Malta in 1565. It is found on the seaward shore of the Sciberras Peninsula between Marsamxett and the Grand Harbour. With the Fort Saint Elmo there is the War Museum with a superb collections of items way back to the prehistoric times. Staring form the early Bronze Age early as 2500 B.C. to the present times. Two halls dedicated to Malta’s role in world war 1, the period between both wars from 1918 to 1939. Then Malta’s superb role in world-war-2. You find exhibits related to the Second World War. One of the famous planes you will find exhibited is the ‘Faith’ Gloster Sea Gladiator N5520 biplane and together with the ‘Hope’ and ‘Charity’ played a very important part during the defence of Malta and not least Roosevelt’s Jeep ‘Husky’. Then the most important of all is the award of the George Cross to the Maltese people by King George VI for their heroism and devotion during the war. Below underground you will also find a museum related to Malta’s Second World War. There are also two World War shelters. During the war they were the worst hit especially the Grand Harbour whilst repairs on various ships were being done. This is a wonderful place to visit and the guides are well informed. As the place is quite cold in summer it is ideal to bring a cardigan to keep warm. During this time the local militia had already constructed a watch tower at the far end of the Sciberras peninsula to watch the entrance to both harbours. The militia were the local non-professional fighters. During the time of the Aragonese reign in Malta they built a watch tower dedicated to Erasmus of Formia, better known as Saint Elmo. He was a Christian saint and martyr. When the Knight of St. John arrived in Malta in 1530 they immediately realised the importance of the peninsula guarding the entrance of the harbours where they eventually anchored their fleet. So in 1533 they reinforced the Tower. 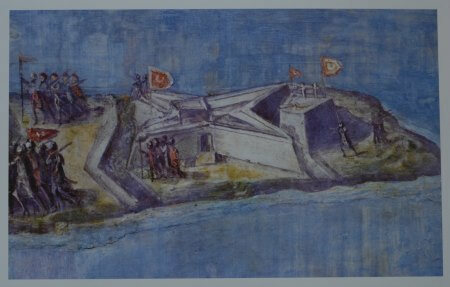 In 1533 they strengthened the defensive tower structure as they were always awaiting any attack from the Turkish navy. During 1551 the Ottomans (Turkish navy) entered Marsamxett Harbour without any opposition and raided the island where they practically ransacked everything. It was further understood that a more complex fortress needed to be built to withstand enemy attacks. The year after 1552 the Knights of St. John constructed a star-shaped fort. This was possible after the Grand Master had asked for assistance from the Viceroy of Sicily where he sent a competent military engineer to design and assist in the construction of the fort. The existing old tower was demolished. Before the siege of 1565 constructed defences were added. 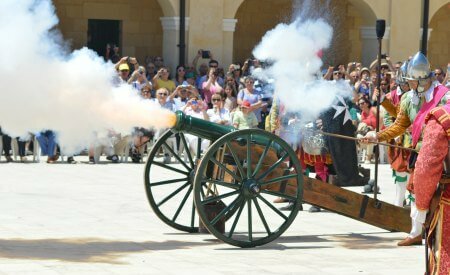 It was one of the most intense battles claiming the lives of many knights and Maltese who defended the fort. It endured a siege of just over a month. © Daniel Cilia/Office of the President of the Republic of Malta. The next year after the siege, although the knights were recovering, Fort St. Elmo started the reconstructing phase, as it was heavily bombarded from higher grounds of the Sciberras peninsula. It was built on a larger scale as we know it today in order to have a better effectiveness during war. By then the construction of Valletta was already planned to start on that same year. 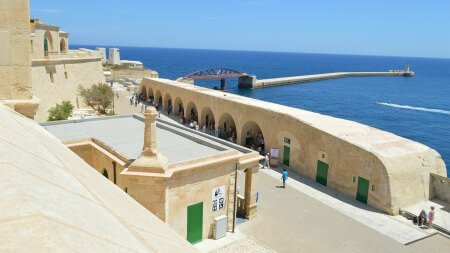 The design of the formation of the fort was integrated with the new fortified walls of Valletta. On various occasions through the years Fort St. Elmo defences were improved due to requirements of more modern warfare. During the British rule the defensive system was reinforced by the construction of a series of gun emplacements. During World War II in 1941, the first air raid on the island was on Fort St. Elmo. Various anti aircaraft posts were built to defend both ports. The fort was neglected for many years. The full restoration of the upper Fort St. Elmo was started and reopened to the general public in 2015. Now it includes the National War Museum which was relocated from the Lower Fort St. Elmo. Just as you go in the entrance, there is the ticket office. After buying your tickets, on the right hand side there are a few steps on the rampart, you can take your first photos of the outstanding views of the Grand Harbour. Located on the opposite side of the Mediterranean Conference Centre (MCC) at the lower end of Valletta, the entrance to Fort St Elmo is opposite the Malta Experience entrance. If you arrive by Malta Public Transport or have parked your car outside the capital city you have to walk down all Republic street or through Merchants street. When you get to the bottom of the street there is Fort St. Elmo. - 1st October to 31st March. - From 09:00 to 17:00. Last admission at 16:30. Note that on Sundays when the In Guardia Parade is on, the museum opens at 12:00 instead of 09:00.